From the 6th to the 17th of November 2017, ASEED will focus its attention on Bonn. During two weeks, the German city will welcome the COP23 and the most influential people of the planet, including lobbyists of big industries and companies whose task is to improve their business and to secure economic growth at the expense of the environment. Precisely to discuss about climate change, kind of ironic right? From the 6th to the 17th of November 2017, ASEED will focus its attention on Bonn. 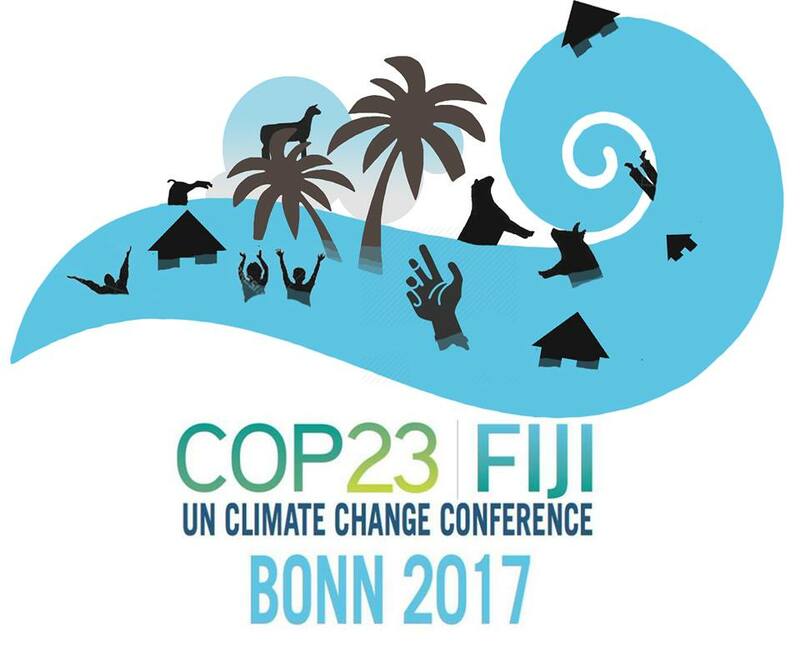 During two weeks, the German city will welcome the COP23 and the most influential people of the planet, including lobbyists of big industries and companies whose task is to improve their business and to secure economic growth at the expense of the environment. Precisely to discuss about climate change, kind of ironic right ? However, the discussions about agriculture may again be marginalized as they were during the COP21 in Paris and the COP22 in Marrakech while the situation is urgent. Around 40% of global GHG emissions occur across the industrial food system (industrial farming, deforestation and land-use change and post production, including transport, cooling and packaging). The heavy increase of meat consumption in the countries of the South (coming closer to the excessive consumption of the countries of the North) led to a great boom of greenhouse gas emissions. In 2013, the livestock farming represents 14,5% of greenhouse connected to human activities. The increase in production of meat also increases the need in water and land. 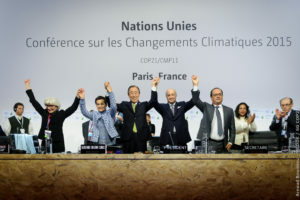 Unlike the COP15 in Copenhagen which cam across as a failure for the vast majority, the Paris agreement was presented as the agreement that was going to save the world from disaster. In the medias, we saw pictures of politicians celebrating, many titles of mainstream press articles describing the agreement as “revolutionary” or “historical”. There were also a lot of comments from experts acknowledging the efforts that have been made to keep global warming under the line of 2 degrees. And the most importantly, there is nothing in the final agreement about the matter of agriculture. The world “agriculture” does not even appears in the text ! For the first time since the COP process was established by the United Nations Framework Convention on Climate Change in 1992, the COP21 was opportunity for the agriculture to be included in discussions. This was especially the case with the launch of the 4 per 1000 initiative which aims to stock carbon dioxide in soil. The idea is pretty simple but still interesting: the plant captures CO2 from the air through photosynthesis. Later when it decomposes, it will produce organic matter that will fix carbon into the soil. This process could improve the quality of the soil, and strengthen ecosystems, and increase agricultural production. However, several commentators had emphasized the blurry aspects of this initiative, which could be highly problematic. 4 per 1000 initiative is a great idea, unless its implementation involves land grabbing! Besides this proposal, there is a list of fake solutions supported during the COP21 such as the Carbon Capture and Storage (CCS), carbon markets, fracking, « natural » gas and biofuels or GM-crops. They simply hide the main problem of overproduction and overconsumption. They are a very good example of greenwashing capitalism instead of really fighting the current business on a planet with finite resources. Filled with promises, the COP22 in Marrakech was supposed to give proper room to agriculture, focusing on the African situation. It should be remembered that 60% of the population of the African continent works in this sector which is particularly sensitive to climate change (Northern African lost 650 000 km² of productive land since 1960 due to the progression of Sahara, a superficial equivalent to the size of France!). This meeting could be considered as disappointing because the negotiators have failed to restart the discussions on what has been started in Paris. We mentioned before that nothing about agriculture was written in the final Paris agreement. Indeed, negotiations were quickly blocked. 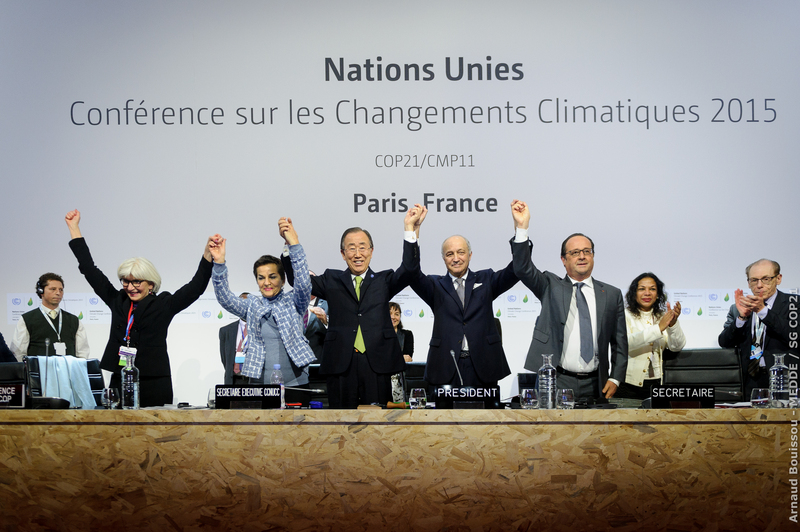 Therefore, the different parties agreed on starting over during COP22 but, once again, it was a failure. Some States whose economies are based on intensive farming, like Argentina, India, the U.S. and Brazil refused to question their agricultural models which release huge quantities of green house gases. Monoculture and meat production have a central place in some of those countries. Then, developing countries expressed regret about the lack of support (mainly economic) from developed countries although the latter talked about a bigger financial involvement in COP21. Nevertheless, three new initiatives were discussed and approved at COP 22 to highlight the potential in agricultural adaptation : Adaptation of African Agriculture (AAA), Global Framework on Water Scarcity and Milan Urban Food Policy Pact. The AAA aims to reduce the vulnerability of Africa and its agriculture to climate change. The initiative fosters projects such as soil management improvement, agricultural water control, climate risk management and capacity building and funding solutions. The Global Framework on Water Scarcity seeks to catalyze international cooperation on water scarcity in agriculture in the context of climate change and growing competition for water resources. And the last initiative called Milan Urban Food Policy Pact is a project focused on adapting urban food systems against climate change calling for sustainable food system within cities. The three initiatives are long term projects which results will theoretically be seen over the years. Let’s see if these agreements will actually help local farmers and urban citizens, or if they are just another initiative that will only benefit big corporations and governments. 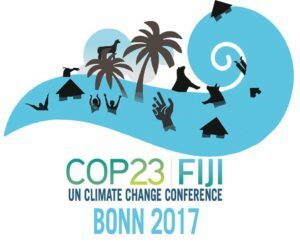 This is the context in which COP23 is going to take place in November. According to Anne-Laure Sablé, in charge of advocacy at CCFD-Terre Solidaire (Catholic Committee Against Hunger and for Development) “This status quo in which the states maintain themselves is unacceptable because it is urgent to act in this area. As long as the transition of our production and consumption models isn’t addressed, the fight against climate change is not handled in its entirety”. This situation is even more unacceptable because if we only focus on the gas emissions related to agriculture. Indeed, the French National Institute of Agricultural Research (INRA) highlights that the mitigation potential (reduction of gas emissions obtainable with improved production methods) of agriculture would be around 30 to 32 million of tons of CO2 equivalent. This equals to a reduction of 20% in the total greenhouse gas emissions! The possibilities and the potential effects are huge. The productivity model defended by most states during the previous summit is too greedy in energy, water and lands. It relies on the heavy use of too many dangerous chemicals and promotes deforestation. Changing our food system is an urgent necessity. If ecological summits like COP21/22/23/24/27/31 are not solving those problems in the near future, we should all take responsibility: citizens, small companies and local politicians and policymakers. We should not wait for an international treaty to tell us what to do. No one needs international agreement to take actions at a local level. There is the very famous example of Detroit in US, but we can also mention what is happening in Rosario in Argentina. It the perfect example of citizens taking actions with the support of the city hall. At a consumer level, it is possible to shift demand away from animal products and towards plant-based foods. For the reasons exposed in the introduction, it is necessary to reduce the consumption of animal calories (primarily red meat). Waste can also be significantly reduced. We are living in a world where one third of the dietary needs of developed countries is thrown away. Finally, as we have seen in this article, so far, COP do not tackling the agricultural problem. This observation should not make us lose sight of the huge possibilities of actions at a local level that exists. The main message here would be, if COP do not do it, we will!